Ninjutsu ( , Return an unblocked attacker you control to hand: Put this card onto the battlefield from your hand tapped and attacking.) 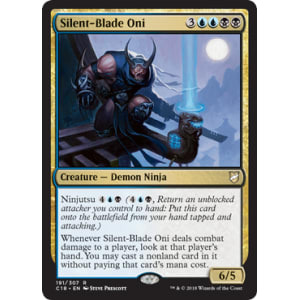 Whenever Silent-Blade Oni deals combat damage to a player, look at that player's hand. You may cast a nonland card in it without paying that card's mana cost.